If Mitch Marner began his career on any team other than the Toronto Maple Leafs or Winnipeg Jets to start the 2016-17 NHL season, he would have been looked at as the future face of the franchise. Coming into the league with fellow superstar rookies Auston Matthews and William Nylander definitely took some pressure off the young star as he began his NHL career in the blue and white sweater. In his rookie year, he finished with 19 goals, 42 assists, and 61 points. The kid fit right into the team and found great chemistry alongside veterans Tyler Bozak and James van Riemsdyk. This season the trio did not seem to have the same connection on the ice as last year and it caused Marner to struggle the first few months of the year. However, since the All-Star Break, Marner has been the Leafs best offensive player and second half most valuable player. 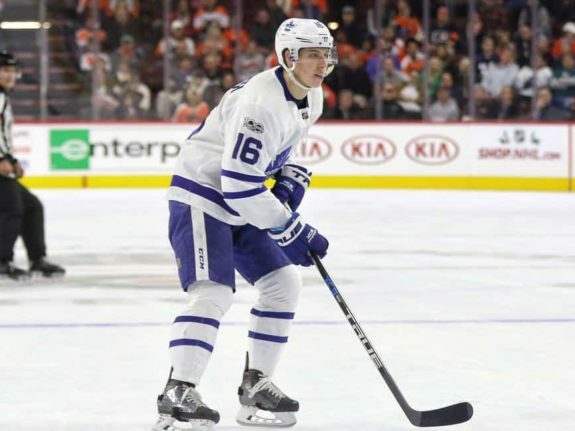 It became clear to coach Mike Babcock that the line of Marner, James van Riemsdyk and Tyler Bozak did not have the same chemistry as last year early in the campaign. Only six games into the season, Marner was demoted to the Leafs fourth line. “Let’s not read too much into this. Their line wasn’t going. Tie goes to the veteran,” said coach Babcock. It was early in the season and no need for Leafs fans to have concerns about the young star’s talent in only his sophomore season. He took everything in stride and began to work harder on all aspects of his game. However, the struggles continued through the first half of the season. From Oct. 17 to Nov. 2, during a 10-game-stretch, Marner only registered points in one game. At the end of November and early December, he did not register a point in seven straight games. One thing was for certain and that was Marner’s attitude and mindset did not change as he continuously stayed positive. He noted how much he loved playing with Martin and Gauthier because of their ability to open up space for him on the ice. After the All-Star Break, when the games got more meaningful and tighter checking, it was Marner who elevated his play significantly. This was huge for the Toronto Maple Leafs as Auston Matthews was in and out of the lineup with injuries during the second half. So what exactly changed to get Marner back to his dominant offensive self? Marner’s game was back at the high level he displayed as a rookie after he was paired on the Leafs second line with center Nazem Kadri and longtime San Jose Shark Patrick Marleau. The move came in a late January game against the Chicago Blackhawks. The ‘Mar-Kad-Mar’ line was born that night and has been a mainstay in the Leafs lineup ever since. Before the move to Kadri’s line, Marner had six goals and 16 assists on the season (in 49 games played). He ended the season scorching hot and tallied 37 points (16 goals) in his last 33 games. It was a perfect combination of the skill of Marner, the ability to win puck battles and play smart in Marleau, and the ability to do a little bit of everything in Kadri. Kadri, who is the longest-tenured Leaf of the trio, had high praise for Marner and the way the line has played. “Mitch adding to that piece of the puzzle has been great,” Kadri said. We all communicate well in the defensive zone and that’s why we’re having so much offensive success because we’ve been able to execute on the breakout which lets us play in the offensive end. It’s no secret how tough it is to stop the Maple Leafs top line. The trio featuring Auston Matthews, William Nylander and Zach Hyman will draw the Patrice Bergeron line and the Bruins top defensive pairing most of this series. The ‘Mar-Kad-Mar’ line also has a tough test in the likes of David Krejci and Rick Nash. However, I believe this line will use their speed and chemistry all series long to do what they do best, and that is create scoring chances. Watch for Mitch Marner to continue his strong play into a series where he will be heavily relied upon for offense.